‘The Lucia Rider’ by author Brigitta Gisella Geltrich-Ludgate is a collection of three stories that convey societal problems with gripping intensity and depth. Hiking through Southwestern mountains and woods and talking to people with the subject of a child having more than one father, author Brigitta Gisella Geltrich-Ludgate was inspired to create a book that consists of three novellas representing societal problems that have to be overcome in order to conclude in a reasoned, positive light. 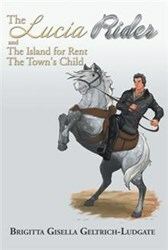 “The Lucia Rider” consists of three novellas, each self-contained and inspired by a city or by a countryside where the author was living or visiting, or by folklore. The first novella takes place in California, wherein a mystery rider has to clear up his family name and family doings. Can the evil doings of a family be rectified, even if it is after death? The second novella deals with an architect living with his family on an island, whose wife passes away giving birth to their third child. Becoming an instant single parent, he needs to learn to raise his children without sending them off to boarding schools and/or in-laws on the mainland. The third novella deals with a little girl who has two fathers and a whole town of caring adults who has to decide for herself where she wants to grow up. Readers will follow a child who needs to decide with whom to stay: Will it be with her father one, father two, or with the whole town? “The Lucia Rider” is a riveting saga that will take readers into deeply insightful stories full of drama, thrills, hope and uncontrollable emotions. This book exposes some gripping societal problems that need attention. From it, readers from all ages will definitely learn something about life in general and all of the complexities that come in between.